An acid-base reaction is a chemical reaction that occurs between an acid and a base. Several concepts exist which provide alternative definitions for the reaction mechanisms involved and their application in solving related problems. Despite several similarities in definitions, their importance becomes apparent as different methods of analysis when applied to acid-base reactions for gaseous or liquid species, or when acid or base character may be somewhat less apparent. Historically, the first of the scientific concepts of acids and bases was provided by the French chemist Antoine Lavoisier, circa 1776. Lavoisier's knowledge of strong acids was mainly restricted to oxyacids, which tend to contain central atoms in high oxidation states surrounded by oxygen, such as HNO3 and H2SO4, and he was not aware of the true composition of the hydrohalic acids, HCl, HBr, and HI. From his limited knowledge, he defined acids in terms of their content of oxygen, and he named oxygen from Greek words meaning "acid-former" (from the Greek οξυς (oxys) meaning "acid" or "sharp" and γεινομαι (geinomai) or "engender"). The Lavoisier definition was held as absolute truth for over 30 years, until the 1810 article and subsequent lectures by Sir Humphry Davy, in which Davy proved the lack of oxygen in hydrogen sulfide (H2S), hydrogen telluride (H2Te), and the hydrohalic acids. Around 1838, Justus von Liebig proposed a new definition of acids, based on his extensive works on the chemical composition of organic acids. This finished the doctrinal shift from oxygen-based acids to hydrogen-based acids, started by Davy. According to Liebig, an acid is a hydrogen-containing substance in which the hydrogen could be replaced by a metal. Liebig's definition, while completely empirical, remained in use for almost 50 years until the adoption of the Arrhenius definition. 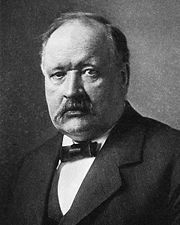 Devised after the metal-replacement theory of Justus von Liebig and despite some modifications by later theories, the Arrhenius (pictured) concept remains a simple scientific definition of acid-base reaction character. The Arrhenius definition of acid-base reactions is a more simplified acid-base concept devised by Svante Arrhenius, which was used to provide a modern definition of bases that followed from his work with Friedrich Wilhelm Ostwald in establishing the presence of ions in aqueous solution in 1884, and led to Arrhenius receiving the Nobel Prize in Chemistry in 1903 for "recognition of the extraordinary services … rendered to the advancement of chemistry by his electrolytic theory of dissociation". As defined at the time of discovery, acid-base reactions are characterized by Arrhenius acids, which dissociate in aqueous solution form hydrogen or the later-termed oxonium (H3O+) ions, and Arrhenius bases which form hydroxide (OH-) ions. More recent IUPAC recommendations now suggest the newer term "hydronium" be used in favor of the older accepted term "oxonium" to illustrate reaction mechanisms such as those defined in the Brønsted-Lowry and solvent system definitions more clearly, with the Arrhenius definition serving as a simple general outline of acid-base character More succinctly, the Arrhenius definition can be surmised as, "Arrhenius acids form hydrogen ions in aqueous solution with Arrhenius bases forming hydroxide ions." The universal aqueous acid-base definition of the Arrhenius concept is described as the formation of water from hydrogen and hydroxide ions, or hydronium ions and hydroxide ions produced from the dissociation of an acid and base in aqueous solution (2 H2O → OH- + H3O+ ), which leads to the definition that in Arrhenius acid-base reactions, a salt and water is formed from the reaction between an acid and a base— in more simple scientific definitions, this form of reaction is called a Neutralization reaction. The Brønsted-Lowry definition, formulated independently by its two proponents Johannes Nicolaus Brønsted and Martin Lowry in 1923 is based upon the idea of protonation of bases through the de-protonation of acids—more commonly referred to as the ability of acids to "donate" hydrogen ions (H+) or protons to bases, which "accept" them. In contrast to the Arrhenius definition, the Brønsted-Lowry definition refers to the products of an acid-base reaction as conjugate acids and bases to refer to the relation of one proton, and to indicate that there has been a reaction between the two quantities, rather than a "formation" of salt and water, as explained in the Arrhenius definition. The Lewis definition of acid-base reactions, devised by Gilbert N. Lewis in 1923 is an encompassing theory to the Brønsted-Lowry and solvent-system definitions with regards to the premise of a donation mechanism, which conversely attributes the donation of electron pairs from bases and the acceptance by acids, rather than protons or other bonded substances and spans both aqueous and non-aqueous reactions. In reactions between Lewis acids and bases, there is the formation of an adduct when the highest occupied molecular orbital (HOMO) of a molecule, such as NH3 with available lone electron pair(s) donates lone pairs of electrons to the electron-deficient molecule's lowest unoccupied molecular orbital (LUMO) through a co-ordinate covalent bond; in such a reaction, the HOMO-interacting molecule acts as a base, and the LUMO-interacting molecule acts as an acid. In highly-polar molecules, such as boron trifluoride (BF3), the most electronegative element pulls electrons towards its own orbitals, providing a more positive charge on the less-electronegative element and a difference in its electronic structure due to the axial or equatorial orbiting positions of its electrons, causing repulsive effects from lone pair-bonding pair (Lp-Bp) interactions between bonded atoms in excess of those already provided by bonding pair-bonding pair (Bp-Bp) interactions. Adducts involving metal ions are referred to as co-ordination compounds. The most general definition is that of the Russian chemist Mikhail Usanovich, and can basically be summarized as defining an acid as "anything that accepts negative species or donates positive ones," and a base as the reverse. This tends to overlap the concept of redox (oxidation-reduction), and so is not highly favored by chemists. This is because redox reactions focus more on physical electron transfer processes, rather than bond making/bond breaking processes, although the distinction between these two processes is somewhat ambiguous. In 1963, Ralph Pearson proposed an advanced qualitative concept known as Hard Soft Acid Base principle, later made quantitative with help of Robert Parr in 1984. 'Hard' applies to species which are small, have high charge states, and are weakly polarizable. 'Soft' applies to species which are large, have low charge states and are strongly polarizable. Acids and bases interact and the most stable interactions are hard-hard and soft-soft. This theory has found use in both organic and inorganic chemistry. ↑ L.M. Miessler and D.A. Tarr (1991), 166 - Table of discoveries attributes Antoine Lavoisier as the first to posit a scientific theory in relation to oxyacids. ↑ Miessler and Tarr (1991), 166 - Table of discoveries attributes Justus von Liebig's publication as 1838. ↑ Richard L. Meyers, The Basics of Chemistry (Westport, CT: Greenwood Press, 2003), 156. ↑ H.L. Finston and A.C. Rychtman, A New View of Current Acid-Base Theories (New York: John Wiley & Sons, 1982), 140-146. ↑ 5.0 5.1 5.2 5.3 5.4 5.5 5.6 Miessler and Tarr (1991), 165. ↑ International Union of Pure and Applied Chemistry, Oxonium ylides. IUPAC Gold Book, 2006. Retrieved July 27, 2018. ↑ 9.0 9.1 9.2 Miessler and Tarr (1991), 167-169—According to this page, the original definition was that "acids have a tendency to lose a proton"
↑ 10.0 10.1 J. Clayden, et al. Organic Chemistry (Oxford: Oxford University Press, 2000), 182-184. ↑ Miessler and Tarr (1991), 166 - Table of discoveries attributes the date of publication/release for the Lewis theory as 1923. ↑ 12.0 12.1 12.2 12.3 12.4 12.5 12.6 12.7 12.8 Miessler and Tarr (1991), 170-172. ↑ H. Franz, Solubility of Water Vapor in Alkali Borate Melts. J. Am. Ceram. Soc. 49(9) (1966): 473–477. ↑ Hermann Lux, "Säuren" und "Basen" im Schmelzfluss: die Bestimmung. der Sauerstoffionen-Konzentration. Ztschr. Elektrochem 45 (4): 303–309. Translated as: Hermann Lux, “Acids” and “bases” in a fused salt bath: the determination of oxygen-ion. Journal of Electrochemistry 45(4) (1939): 303–309. ↑ H. Flood and T. Forland, The Acidic and Basic Properties of Oxides. Acta Chem. Scand. 1 (1947): 592. ↑ Russel S. Drago, and Kenneth W. Whitten, The Synthesis of Oxyhalides Utilizing Fused-Salt Media. Inorg. Chem. 5(4) (1966): 677–682. ↑ Ralph G. Pearson, Hard and Soft Acids and Bases. J. Am. Chem. Soc. 85(22) (1963): 3533–3539. Brown, Jr., Theodore L., H. Eugene LeMay, Bruce Edward Bursten, and Julia R. Burdge. Chemistry: The Central Science, 9th ed. Upper Saddle River, NJ: Prentice Hall, 2002. ISBN 0130669970. Clayden, Jonathan, et al. Organic Chemistry. Oxford: Oxford University Press, 2000. ISBN 0198503474. Drago, Russel S., and Kenneth W. Whitten. The Synthesis of Oxyhalides Utilizing Fused-Salt Media. Inorg. Chem. 5(4) (1966): 677–682. Flood, H. and T. Forland. The Acidic and Basic Properties of Oxides. Acta Chem. Scand. 1 (1947): 592. Franz, H. Solubility of Water Vapor in Alkali Borate Melts. J. Am. Ceram. Soc. 49(9) (1966): 473–477. Miessler, Gary L., and Donald A. Tarr. Inorganic Chemistry. Englewood Cliffs, NJ: Prentice-Hall, 1991. ISBN 0134656598. Myers, Richard L. The Basics of Chemistry. Basics of the Hard Sciences. Westport, CT: Greenwood Press, 2003. ISBN 0313316643. Pearson, Ralph G. Hard and Soft Acids and Bases. J. Am. Chem. Soc. 85(22) (1963): 3533–3539. All links retrieved July 27, 2018. This page was last modified on 27 July 2018, at 15:26.